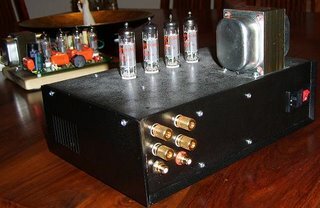 This is Mark's build of the inexpensive and popular S-5 Electronics K-12M Tube Amplifier Kit. Actually, Mark has built three of these fantastic sounding tube amplifier kits! Mark has experimented quite a bit with these kits and his modifications include snubbers, a beefed up power supply, an upgraded power transformers and Hammond output transformers. I am always impressed with Mark's enclosure skills and look forward to seeing more of his diy audio projects. For more information about these inexpensive tube amplifier kits, see: S-5 Electronics Tube Amplifier Kits.